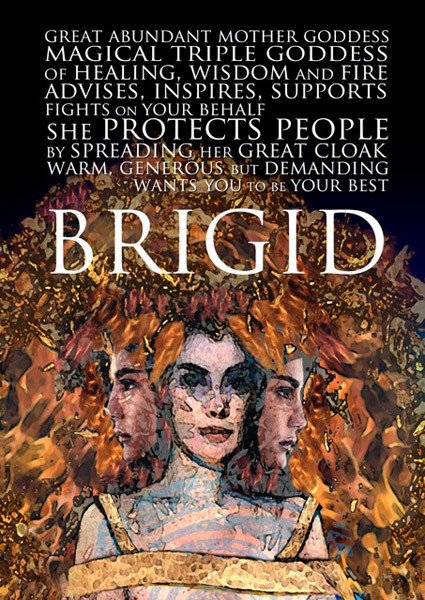 Daughter of a wealthy landowner Dubthach and a slave woman, Brigid was born on the 1st day of February at the instant the sun came over the horizon. When she was born a light shone out from her forehead so brightly that all the neighbours came running fearing that the house was on fire. Dubthach, a devout pagan, named his daughter Brigid in honour of the pagan goddess and the young girl grew up very beautiful. Though her father feared she might be half a fool she gave away everything to those in need. She gave meat meant for her father’s table to a starving dog, but when she realised that she would get in trouble and said a prayer the joint became whole again. She gave a pail of milk to an old beggar woman but when she tried to milk the cow again, it gave her three more pails of milk. Most troubling of all when her father brought her before the High King to see if anything could be done with her, she gave away his jewelled dagger to a beggar while he and the king where talking. Luckily the High King convinced him that this girl was special. The girl Brigid heard the sermons of St. Patrick and she decided that she wanted to dedicate her life to this Christian God. But there was no place for women in the Church at the time. Her mother invited the Bishop to come to their house and meet her daughter sure that he would see her potential. When the girl was called in from the fields where she had been working she hung up her cloak and went to shake the Bishop’s hand only to find that he was gaping at her. She had hung her cloak up on a sun beam and had not even noticed. With this and the other miracles she had performed, Brigid was welcomed into the early Church but her father was not at all happy about this. He did not want anything to do with this new religion and he tried to force her to marry. She was very beautiful and he was able to find a suitor for her without too much trouble. The night before her wedding Brigid prayed to God for help and in the morning when her bridegroom saw her he was horrified. His lovely bride had transformed into a hideous crone. Brigid said that if he released her he would go to a certain spot in the woods and would find there a lovely maiden and everything he said would be pleasing to her. The young man readily agreed and both he and Brigid were happy. Her new hideous appearance remained until the day she took her vows as a nun when her beauty was restored to her. It was because of this beauty that a man tried to entrap her thinking that if he seduced her once she would have to leave the Church and become his wife. He gave her a precious brooch and charged her with keeping it safe knowing that if she failed in this he would have a claim over her. He stole the brooch from her and cast it into the sea. When he went and asked her for the brooch back, of course Brigid could not find it. She asked him to stay for dinner while it was searched for and she blessed the fish she was about to carve for the meal. When she cut into the fish, she found the same gold brooch in its belly. The man bowed to St. Brigid in remorse. St. Brigid attracted many followers, women who wanted to join her on this path. She started to look for a place to build her Abbey. She went to the King of Leinster and asked for a piece of land from him. He laughed at her, but when she smiled at him and asked for only the land that her cloak could cover, he agreed to that. So St. Brigid spread her cloak out on the ground and it grew and grew until it covered the whole province. When the King cried out that he was ruined, St. Brigid told him that she would only take what she needed provided he learnt his lesson and not be so tight fisted in the future. She built a great Abbey in Kildare on the same site as the Grove of the Goddess, Brigid. For centuries to follow, the Abbess of Kildare would be regarded as the superior general over all the monasteries of Ireland, equal in authority to any bishop. St. Brigid became famous for her healing, her kindness and the abundance that seemed to follow her wherever she went. One day a woman gave her a gift of apples and saw her go only a short way down the road where she gave them to a bunch of lepers. The woman was angry and thereafter her orchard did not bare any fruit. Another woman gave her the same gift but did not object when Brigid gave the fruit away to beggars but asked instead for her garden to be blessed. St. Brigid told her to cut shoots from a certain tree in her garden and that all the trees that grew from that one would bare twice as much fruit as an ordinary one. On her father’s deathbed, Dubthach’s daughter returned to tend him and spoke to him of the faith of Christ but the staunch old pagan refused to convert. Picking up rushes from the floor, St. Brigid wove a cross with four equal arms and told him the story of the crucifixion, whereupon Dubthach agreed to convert to Christianity. To this day, the same cross is woven from rushes on the 1st February and hung in houses to protect against fire and to bring good luck. One day on a journey, she met a man carrying a sack of salt and asked him for a little to season her porridge. He refused, claiming that he was carrying stones. St. Brigid replied, “stones be they so” and the man was crushed under the sudden weight of his sack. Once she visited the halls of a king who was absent. His sons welcomed her in but they were terribly ashamed that their father was gone and taken all of the musicians and entertainers with him. So they could not offer her any music at all. She noticed that there were harps hanging on the walls and asked if the King’s sons would play those for her. But they were sad to say that none of them had any musical talent. She touched each of them lightly on the fingers and asked again that they play for her. To their astonishment, when they took the harps down to play they were able to play the most beautiful music. St. Brigid passed a fine night with the best of entertainment in the world and thereafter those king’s sons became famous harpers. One of St. Brigid’s young nuns failed in her vows of chastity and gave in to youthful desire. She became pregnant. When she confessed to St. Brigid, sobbing, St. Brigid forgave her. St. Brigid laid her hands on the woman’s womb and prayed. Without pain and without delivery the child disappeared from her womb and the nun’s chastity was restored to her so she was able to resume her good work in St. Brigid’s Order. Her convent became a beacon for young women in particular who wanted to learn and she kept a flame burning in a sacred grove that only could be attended by women. St. Brigid’s flame burned as late as the 16th Century when it was extinguished by a Vatican priest as a pagan relic. However, the Brigidine Order relit St. Brigid’s flame in 1993 and it burns to this day in the town of Kildare.